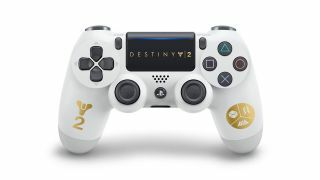 Destiny 2's getting a limited-edition PS4 controller and it looks… fine? Destiny 2 has a lot to live up to in terms of limited-edition PlayStation hardware; just look at that white-and-gold Taken King PS4, still one of the best-looking special editions of this generation. So it's with some consternation that I present to you this new Destiny 2 DualShock 4 controller which, um, has the game's logo printed on the touchpad. And the class logos on the right handle. And then another game logo on the left handle. "Destiny 2 logos" is the overall vibe I'm getting from the design here. As of now, the controller has only been confirmed for Europe, where it will be released alongside Destiny 2 on September 6. Sony also announced another PS4 Pro bundle for Europe, a jet black counterpart to the glacier white option which was previously announced. The specs and bundled-in game/expansion pass are otherwise identical, and note that neither console includes the limited-edition controller - you'll have to buy it separately. I mean, if you really want. Not-so-special controller aside, the game itself is still worth getting excited for. Check out our Destiny 2 news article for all the info you need, and find out the fate of the Destiny 2 beta's killer turbines.